A handheld tricorder is as good a reason as any to start a project. The science-fiction-derived form factor provides an opportunity to work on a lot of different areas of hardware development like portable power, charging, communications between sensor and microcontroller. And of course you need a user interface so that the values being returned will have some meaning for the user. [Marcus B] has done a great job with all of this in his first version of a medical tricorder. The current design hosts two sensors, one measures skin temperature using infrared, the other is a pulse sensor. For us it’s not the number of sensors that makes something a “tricorder” but the ability of the device to use those sensors to make a diagnosis (or to give the user enough hints to come to their own conclusion). [Marcus] shares similar views and with that in mind has designed in a real-time clock and an SD card slot. These can be used to log sensor data over time which may then be able to suggest ailments based on a known set of common diagnosis parameters. Looking at the image above you may be wondering which chip is the microcontroller. This build is actually a shield for an Arduino hiding underneath. There’s a demonstration video after the break. And if you find this impressive you won’t want to miss the Open Source Science Tricorder which is one of the finalists for the 2014 Hackaday Prize. 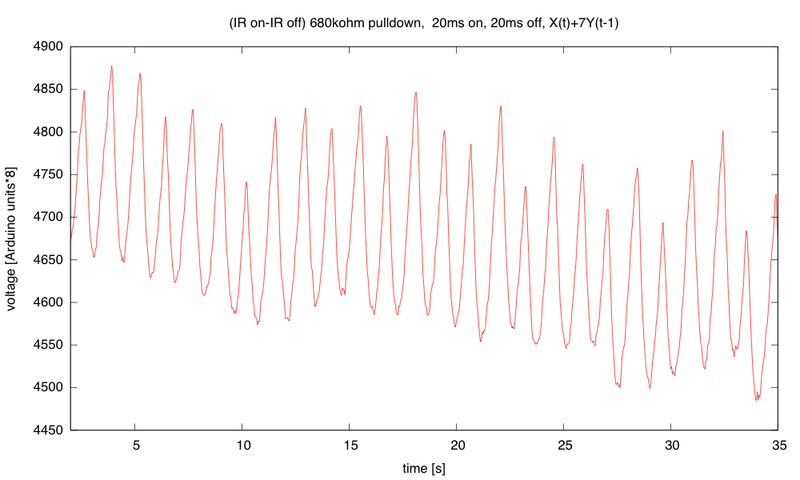 (click to embiggen) Yesterday’s plot with digital low-pass filtering, using y(t) = (x(t) + 7 y(t-1) )/8. There is not much noise, but the baseline wobbles up and down a lot, making the signal hard to process automatically. The grid line in the center is at 3v. 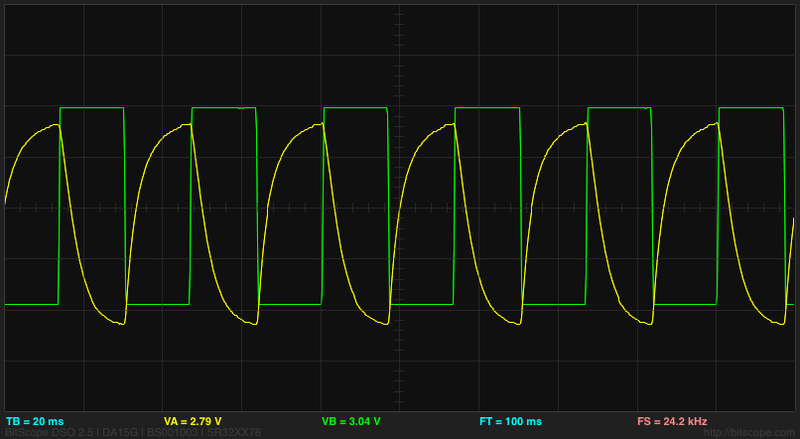 The green trace is the signal to on the positive side of the IR LED, so the LED is on when the trace is low (with 32mA current through the pullup resistor). The yellow trace is the voltage at the Arduino input pin: high when light is visible, low when it is dark. This recording was made with my middle finger between the LED and the phototransistor. To get the gain of the filter at a frequency f, you just compute , where . Note that the z values that correspond to sinusoids are along the unit circle, from DC at up to the Nyquist frequency at . This is known as the “direct” implementation. It takes a bit more memory than the “canonical” implementation, but has some nice properties when used with small-word arithmetic—the intermediate values never get any further from 0 than the output and input values, so there is no overflow to worry about in intermediate computations. I tried using an online web tool to design the filter http://www-users.cs.york.ac.uk/~fisher/mkfilter/, and I got some results but not everything on the page is working. One can’t very well complain to Tony Fisher about the maintenance, since he died in 2000. I tried using the tool at http://digitalfilter.com/enindex.html to look at filter gain, but it has an awkward x-axis (linear instead of logarithmic frequency) and was a bit annoying to use. So I looked at results from Tony Fisher’s program, then used my own gnuplot script to look at the response for filter parameters I was interested in. The filter program gave me one obvious result (that I should not have needed a program to realize): the two zeros need to be at DC and the Nyquist frequency—that is at ±1. That means that the numerator of the transfer function is just , and b0=1, b1=0, and b2=–1. The other two parameters it gave me were a2=0.4327386423 and a1=–1.3802466192. Of course, I don’t want to use floating-point arithmetic, but small integer arithmetic, so that the only division I do is by powers of 2 (which the compiler turns into a quick shift operation). with A1 and A2 restricted to be integers. Rounding the numbers from Fisher’s program suggested A1=-44 and A2=14, but that centered the filter at a bit higher frequency than I liked, so I tweaked the parameters and drew plots to see what the gain function looked like. I made one serious mistake initially—I neglected to check that the two poles were both inside the unit circle (they were real-valued poles, so the check was just applying the quadratic formula). My first design (not the one from Fisher’s program) had one pole outside the unit circle—it looked fine on the plot, but when I implemented it, the values grew until the word size was exceeded, then oscillated all over the place. When I realized what was wrong, I checked the stability criterion and changed the A2 value to make the pole be inside the unit circle. 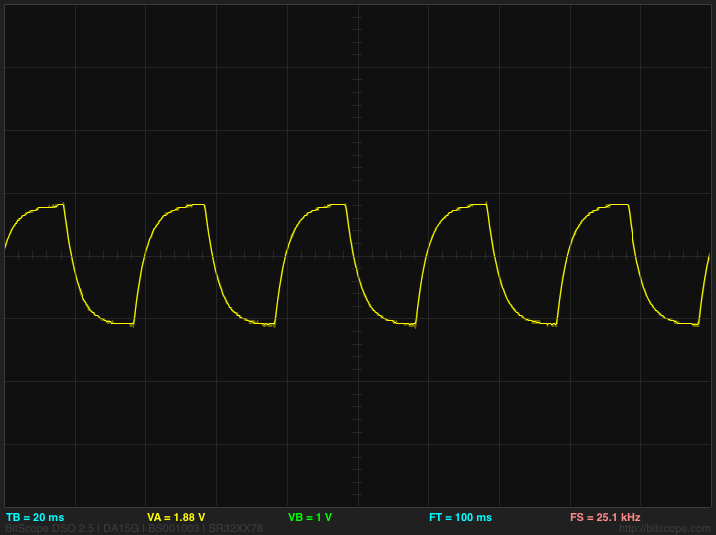 (click to embiggen) The gain of the filter that I ended up implementing has -3dB points at about 0.43 and 2.15 Hz. Here is the gnuplot script I used to generate the plot—it is not fully automatic (the xtics, for example, are manually set). Click it to expand. 20*log(gain(peak,A0,0,-A0,  A0,A1,A2))-3 title "approx -3dB"
// Direct implementation seems to avoid overflow better. // There is probably still a bug in the canonical implementation, as it is quite unstable. volatile uint8_t first_tick;    // Is this the first tick after setup? 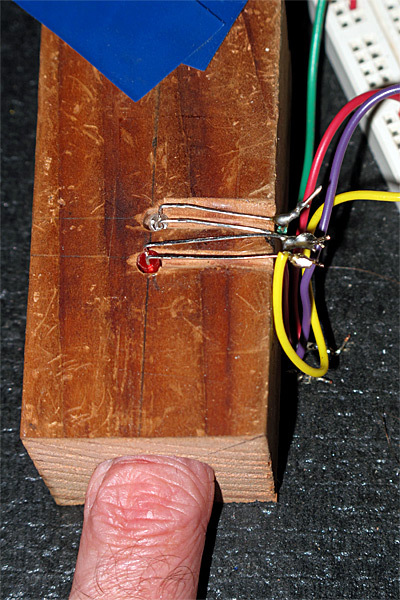 (click to embiggen) The input signals here are fairly clean, but different runs often get quite different amounts of light through the finger, depending on which finger is used and the alignment with the phototransistor. 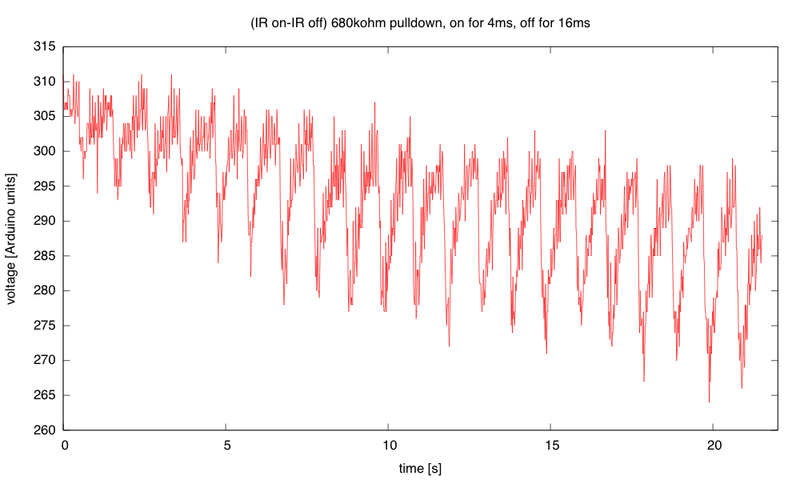 Note that the DC offset shifts over the course of each run. (click to embiggen) After filtering the DC offset and the baseline shift are gone. The two very different input sequences now have almost the same range. 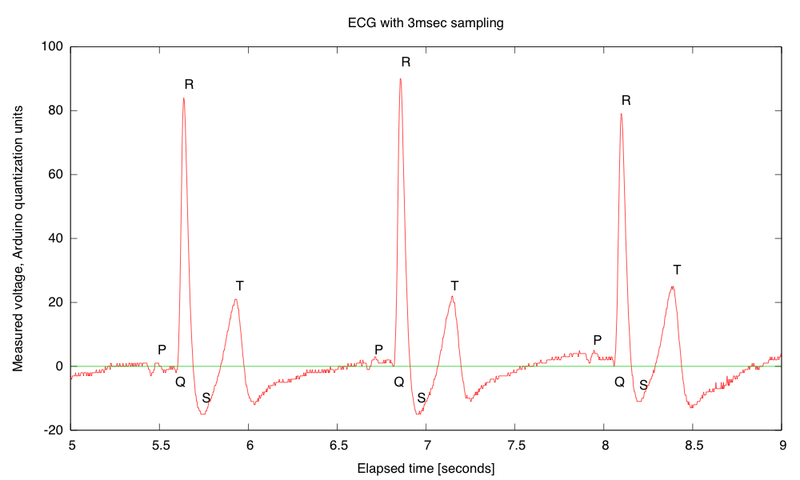 There is a large, clean downward spike at the beginning of each pulse. Overall, I’m pretty happy with the results of doing digital filtering here. 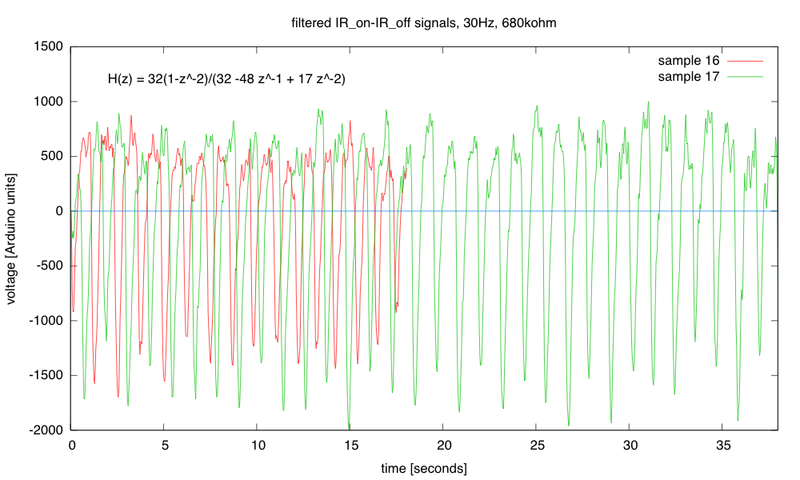 Even a crude 2-zero, 2-pole filter using just integer arithmetic does an excellent job of cleaning up the signal. In yesterday’s blog post, I talked mainly about what my son did with his time yesterday, to mention the small amount of debugging help I gave him. Today I’ll post about what I did with most of my time yesterday. This year, I am hoping to lead a 2-unit freshman design seminar for bioengineering students. (Note: I did not say “teach” here, as I’m envisioning more of a mentoring role than a specific series of exercises.) One thing I’m doing is trying to come up with design projects that freshmen with essentially no engineering skills can do as a team. They may have to learn something new (I certainly hope they do! ), but they should only spend a total of 60 hours on the course, including class time. Since I want to spend some of class time on lab tours, lab safety, using the library resources, and how to work in a group effectively, there is not a lot of time left for the actual design and implementation. One of the things I found very valuable in designing the Applied Circuits course was doing all the design labs myself, sometimes several times, in order to tweak the specs and anticipate where the students would have difficulty. I expect to do some redesign of a couple of the circuits labs this year, but that course is scheduled for Spring (and finally got official approval this week), while the (not yet approved) freshman seminar is scheduled for Winter. So I’m now experimenting with projects that I think may be suitable for the freshman design seminar. These students cannot individually be expected to know anything useful, high school in California being what it is. As a group, though, I think I can expect a fair amount of knowledge of biology, chemistry, and physics, with perhaps a sprinkling of math and computer programming. I can’t expect any electronics knowledge, and we won’t have access to a machine shop—we may get permission for the students to use a laser cutter under supervision. We can probably get some space in an electronics lab, but maybe not in a bio lab (the dean took away the department’s only teaching lab, with a “promise” to build a bigger one—but it is unlikely to be available for the freshmen by Winter quarter—I miss our first dean of engineering, as we seem to have had a series of incompetent deans since then). So I’m looking for projects that can essentially be built at home with minimal tools and skills, but that are interesting enough to excite students to continue to higher levels in the program. And I want them to be design projects, not kit-building or cookbook projects, with multiple possible solutions. An optical growth meter for continuously monitoring a liquid culture of bacteria or yeast. The electronics here is just a light source (LED or laser diode with current-limiting resistor), a phototransistor, a current-to-voltage converter for the phototransistor (one resistor), and a data logger (like the Arduino Data Logger we use for the circuits course). The hard part is coming up with a good way to get uniform sampling of the liquid culture while it is in an incubator on a shaker table. There are lots of possible solutions: mounting stuff around flasks, immersed sensors, bending glass tubing so that the swirling culture is pumped through the tubes, external peristaltic pumps, … . Design challenges include how the parts of the apparatus that touch the culture will be sterilized, how to keep things from falling apart when they are shaken for a couple of days, and so forth. I’ve not even started trying to do a design here, though I probably should, as the mechanical design is almost all unfamiliar to me, and I’d be a good example of the cluelessness that the students would bring to the project. An optical pulse sensor or pulse oximeter. This is the project I decided to work on yesterday. The goal is to shine light through a finger and get a good pulse signal. (I tried this last summer, making a very uncomfortable ear clip and doing a little testing before rejecting the project for the circuits course.) If I can get good pulse signals from both red and IR light sources, I should be able to take differences or ratios and get an output proportional to blood oxygenation. A phototransistor is essentially a light-to-current converter. The current through the phototransistor is essentially linear in the amount of light, over a pretty wide range. The Arduino analog inputs are voltage sensors, so we need to convert the current to a voltage. 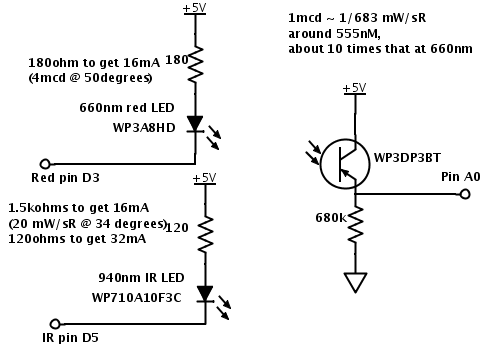 The simplest way to do this is to put a series resistor to ground, and measure the voltage across the series resistor. The voltage we see is then the current times the resistance. Sizing the resistor is a design task—how big a current do we get with the intensity of light through the finger, and how much voltage do we need. The voltage needed can be estimated from the resolution of the analog-to-digital converter, but the amount of light is best measured empirically. One problem that the pulse monitor faces is huge variations in ambient light. Ideally the phototransistor gets light only from LED light shining through the finger, but that is a bit hard to set up while breadboarding. Distinguishing the ambient light from the light through the finger can be difficult. Yesterday, I tried to reduce that problem by using “synchronous decoding”. That is, I turned the LED on and off, and measured the difference between the phototransistor current with the LED on and with the LED off. Using the Arduino to control the LED as well as to read the voltage is fairly easy—these are the sorts of tasks that are starter projects on the Arduino, so should be within the capabilities of the freshmen (with some learning on their part). The x-axis is 20ms/division, and the y-axis 1v/division, with the center line at 2v. 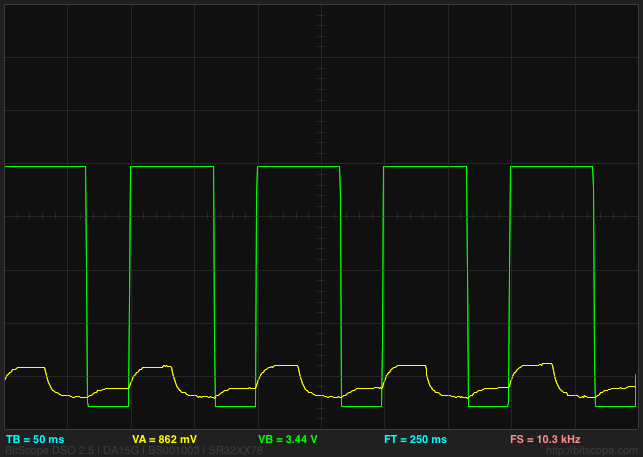 I put in a 50% duty cycle (20ms on, 20ms off). The IR light is shining through my index finger. Note that ambient light results in a DC shift of the waveform without a change in shape, until it gets bright enough that the current is more than 5v/680kΩ (about 7µA), at which point the signal gets clipped. Unfortunately, ordinary room lighting is enough to saturate the sensor with this large a series resistor. I was able to get fairly consistent readings by using the clothespin ear clip I made last summer, clamped open to make it the right size for my finger. I did even better when I put the clip and my hand into a camera bag that kept out most of the ambient light. Clearly, mechanical design for eliminating ambient light will be a big part of this design. 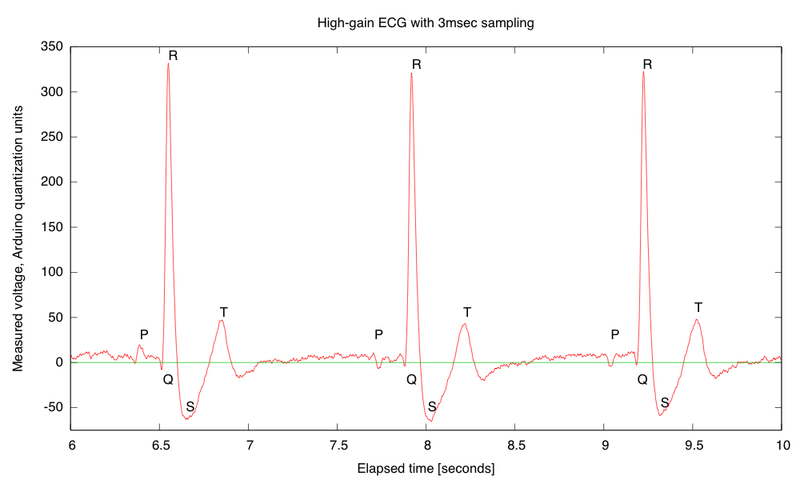 (click to embiggen) The pulse here is quite visible, but is only about a 15–30 count change in the 300-count amplitude signal. Noise from discretization (and other sources) makes the signal hard to pick out auotmatically. This signal was recorded with the Arduino data logger, but only after I had modified the data logger code to turn the IR emitter on and off and report differences in the readings rather than the readings themselves. 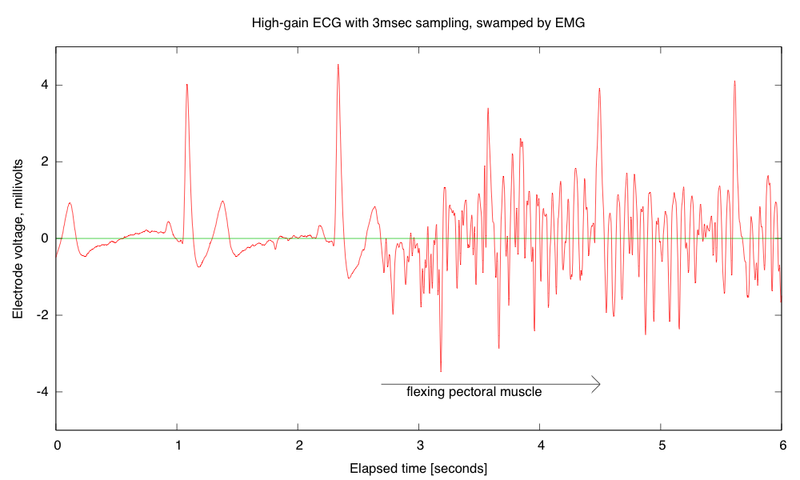 Note the sharp downward transition (increased opacity due to more blood) at the beginning of each pulse. To get a bigger, cleaner signal, I decided to do some very crude low-pass filtering on the Arduino. 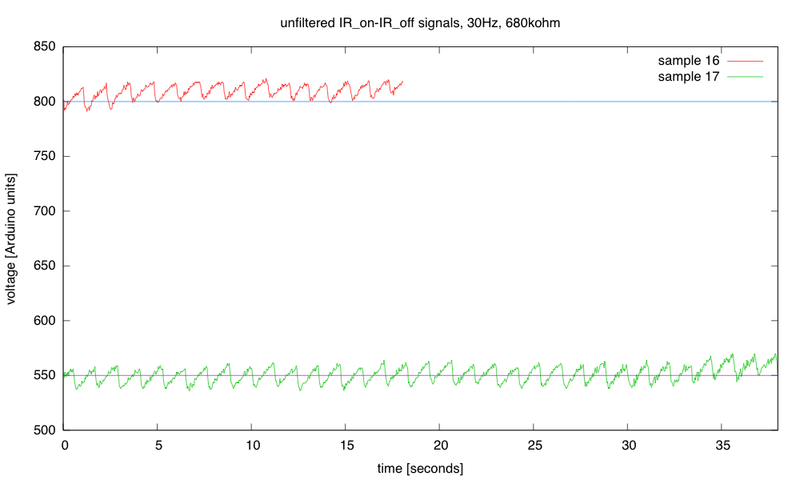 I used the simplest of infinite-impulse response (IIR) filters: . Because division is very slow on the Arduino, I limited myself to simple shifts for division: a= 1/2, 1/4, or 1/8. To avoid losing even more precision, I actually output then divided by 8 to get Y(t). I also used a 40msec sampling period, with the IR emitter on for 20ms, then off for 20msec (the waveform shown in the oscilloscope trace above). (click to embiggen) With digital low-pass filtering, the pulse signal is much cleaner, but the sharp downward transition at the start of each pulse has been rounded off by the filter. This data was not captured with the Arduino Data Logger, but by cutting and pasting from the Arduino serial monitor, which involves simpler (hence more feasible for freshmen) programming of the Arduino. I now have a very clean pulse signal, using just the Arduino, an IR emitter, a phototransistor, and two resistors. There is still a huge offset, as the signal is 200 counts out of 4600, and the offset fluctuates slowly. 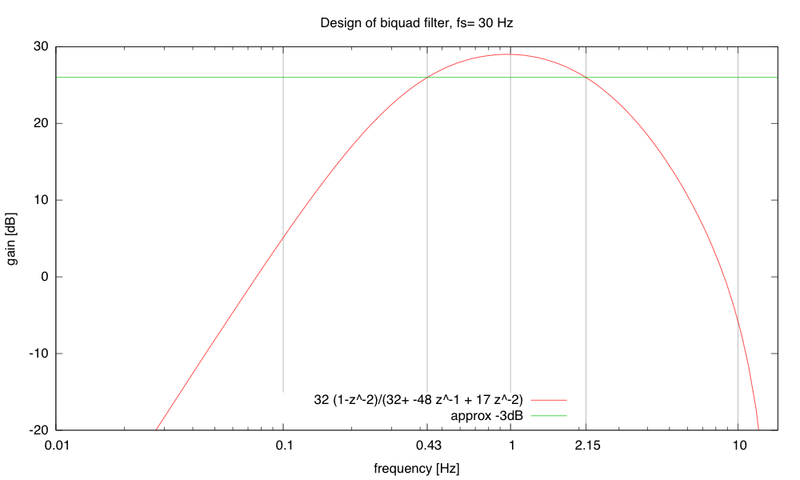 To get a really good signal, I’d want to do a bandpass filter that passes 0.3Hz to 3Hz (20bpm–200bpm), but designing that digital filter would be beyond the scope of a freshman design seminar. Even the simple IIR filter is pushing a bit here.